Five Minutes » Blog Archive » Farewell from the World of Tomorrow! Farewell from the World of Tomorrow! 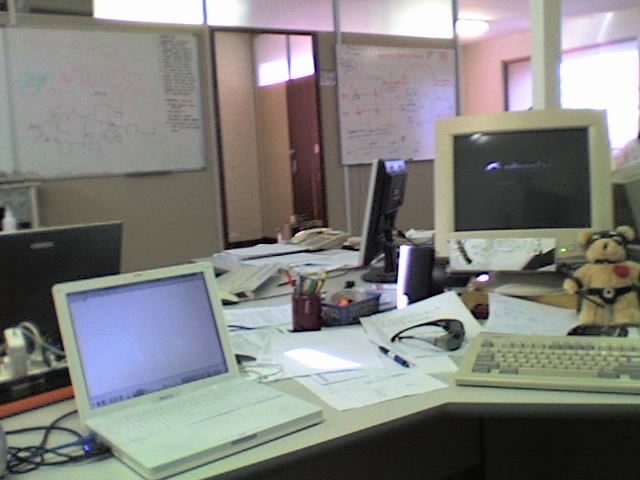 Last day at the office, so I guess I won’t be seeing my desk again in its natural, paper-covered state. Behold! Also, bought a new mobile phone, which took the above picture and then (after a bit of jiggery) even managed to transfer it to my laptop via Bluetooth. Sweet. This entry was posted on Friday, February 23rd, 2007 at 10:19	and is filed under General, Tech Geekery. You can follow any responses to this entry through the RSS 2.0 feed. Both comments and pings are currently closed.